The spot is best in SSE to E winds. It gets up to 30 kites on a busy weekend day. 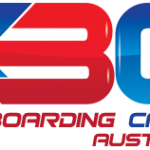 Kiteboarding Cairns operate from May – November every season. The creek mouth has typically stronger wind than right out front of the rigging area and is a preferred riding area for the freestylers. 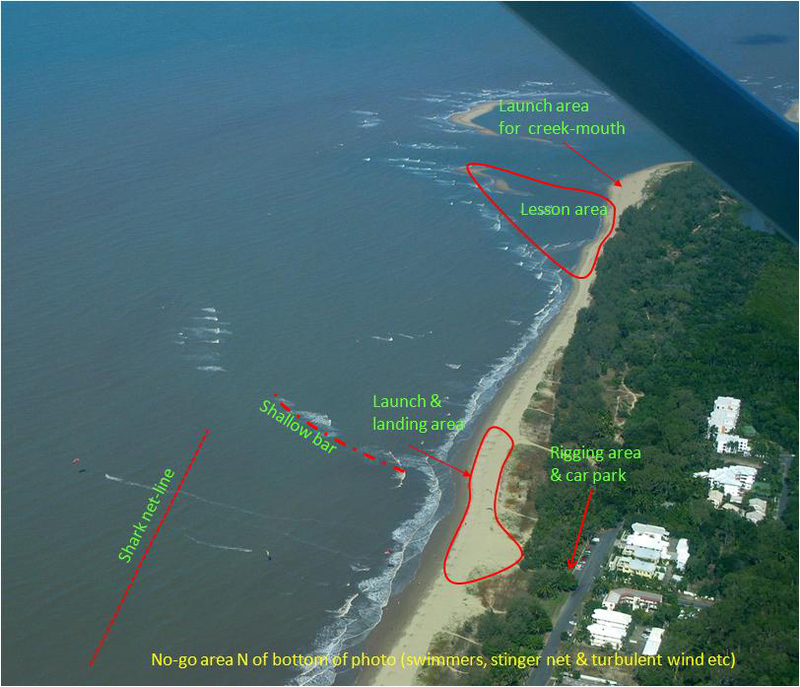 There an unspoken agreement with the clubbies not to kite north of the bottom of the photo in Figure 1, because this is the section most used by swimmers. The wind gets patchy and turbulent closer to the Knob and there’s a rocky groin that should be avoided. If you crash and have to self-rescue around there you’ll end up on the rocks or around the corner in Half-Moon Bay. Respect the locals and the visitors – families with kids, dog walkers, and potentially dazed tourists use the beach and may not know about the dangers associated with power kites. Freshwater taps are near the car park but toilets are right at the north end of the beach. The best estimate of the wind at Yorkeys Knob is to split the difference between the readings at Cairns airport and Green Island. Both sites update every 30min. The spot has different characteristics at different stages of the tide. Low tides produce perfectly flat water near the creek mouth – ideal learning conditions and also extremely popular for freestyle riding. Higher tides produce the better waves on the outer sand bars.Check the tides here. In the wet season (November – April), there are several dangerous marine animals in the area to be aware of. Box Jellyfish are present in these waters. It is extremely rare for find these jellyfish in the kitesurfing season (May – October). Jellyfish don’t like rough water and waves, but they do like to shelter in the mangrove creeks, so creek and river mouth areas have the highest jellyfish risk. A sting from Chironex is potentially fatal and a sting from Irukandji will likely put you in hospital for 48 hours on IV morphine. So if you are out on the water between November and April, it is wise to wear a full length lycra suit under your boardies and harness. They come in a range of fetching colours with hot pink being particularly popular among the local crew, especially on funky-Friday. Anyway, once the south easterly winds kick in in May, the stinger nets are lifted, and the local life guards give the ok for everyone to go swimming and paying in the water. Its extremely rare to sea a jellyfish over this season (May – October). As with the Jellyfish, Saltwater crocodiles are found in the area, and are only active between November and April. Like the jellyfish, they tend to prefer the sheltered creeks rather than the open beaches. They are not likely to make a grab at a speeding kiteboarder. Someone swimming in the creek area is definitely at higher risk than someone riding a board. 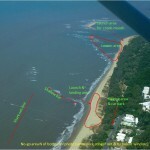 Bottom line is – keep away from the river mouths and you will be fine. Stingrays are rarely found in the creek mouth and over the shallow sand flats. They will only sting you if you step directly on to them. So, if you are doing a lot of walking in shallow water while kiting, then do the stingray shuffle – keeping the feet close to the bottom, rather than stomping around. Also making a bit of a commotion in the water before touching the bottom is a good idea – the ray will sense the vibrations and swim away before your foot lands on it.